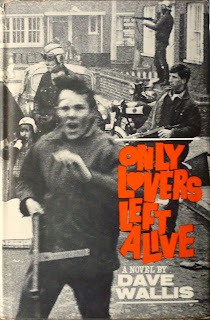 The 1966 Pan Books paperback edition. Bit of an impulse purchase this one; I realised whilst researching the previous Dave Wallis post that the Pan paperback of Only Lovers Left Alive was just as scarce as the Pan edition of Alas, Babylon – possibly even scarcer. There are currently no copies of the Pan paperback of Only Lovers Left Alive for sale on AbeBooks (I bought the only one – sorry) and only two copies on Amazon Marketplace, neither of which look to be in great condition (and they'd set you back at least fifteen quid plus postage anyway). 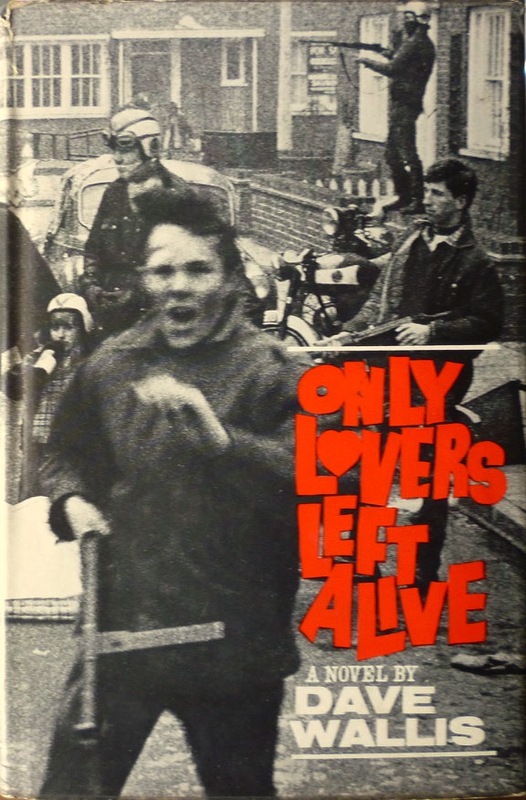 Similar sort of pose for the feral youth in the foreground, similar submachine gun, and the clobber worn by the figures in the background is comparable, too – not to mention the typography, which, on the Pan cover, omits the heart in place of the "o" in "Lovers" in the original and is a little more angular, but is otherwise identical. 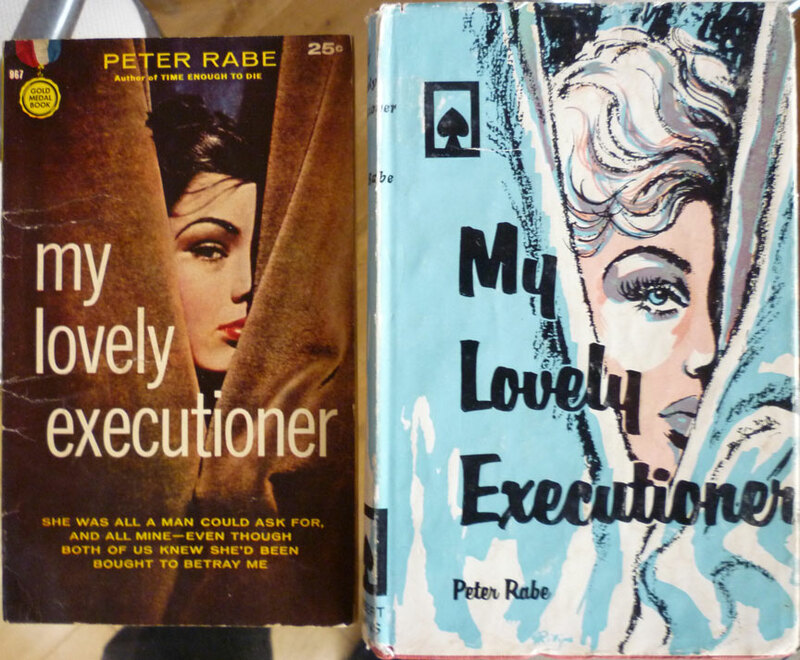 That's the 1960 US Gold Medal paperback of Peter Rabe's My Lovely Executioner and the 1967 UK Herbert Jenkins hardback there. As for my other reasons for acquiring the Pan edition of Only Lovers Left Alive, well, I had a bit more I wanted to write about the novel and its author, but rather than throw it all into one unwieldy post, securing the Pan paperback afforded me the opportunity to pen a follow-up piece (er, the one wot you are reading right now, in case you were wondering). And one thing worth illuminating is that, in the mid-1960s, The Rolling Stones had plans to film the novel. In 1964 The Beatles starred in their debut celluloid outing, A Hard Day's Night, and naturally the Stones wished to follow suit. According to Andrew Loog Oldham, the Stones' manager, at first he and the band attempted to secure the rights to Anthony Burgess's 1962 novel A Clockwork Orange, but Burgess had already sold the rights to Stanley Kubrick. 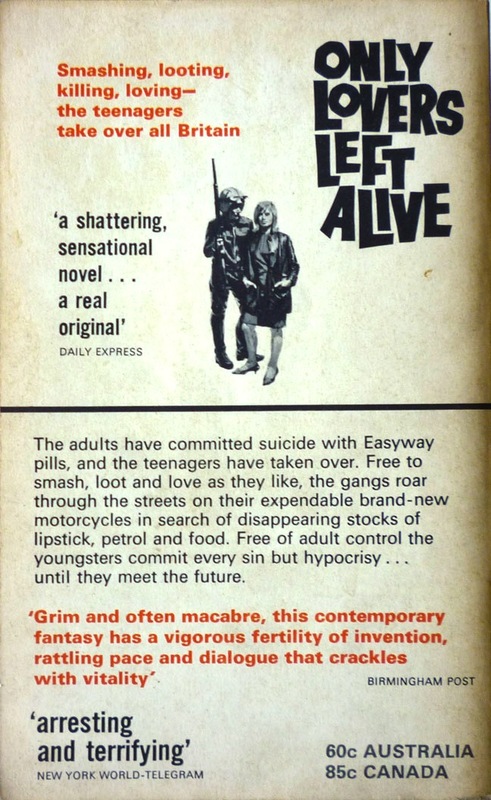 Evidently keen to star in something of a dystopian bent, Oldham and the Stones settled instead on "a second best novel" – Only Lovers Left Alive. There were persistent stories in the press in 1966 that the movie was underway, and that Nicholas Ray was attached to direct, but according to film historian David Kalat in his 2001 book The Strange Case of Dr. Mabuse, although Ray apparently got as far as writing a script, in the end he "was unable to find financial backing, and the Rolling Stones stars lacked confidence in Ray, and the whole matter dissolved". Had Jagger, Ray et al managed to film Only Lovers Left Alive, it's safe to say the novel would have become rather more than a mere post-apocalyptic footnote – it would probably still be in print for one thing – but instead Mick Jagger wound up starring in one of the most iconic films of the 1960s, co-directed by a differently spelled Nicolas – Performance (1968) – and the movie version of Only Lovers Left Alive was forever consigned to "best films never made" lists. 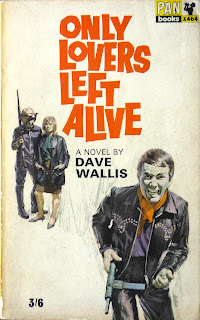 Certainly if the movie had been made, the profile of Only Lovers Left Alive's author, Dave Wallis, would have been elevated. 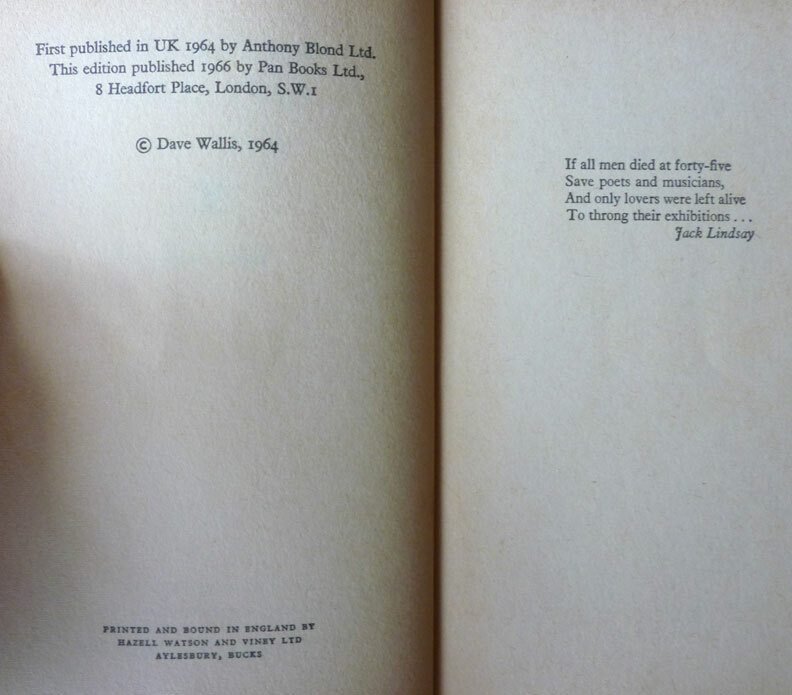 Nobody seems to know much about Wallis, nor indeed what became of him. 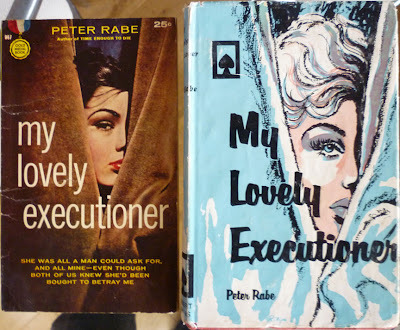 He had one further novel published after Only Lovers Left Alive – Bad Luck Girl, by Macmillan in 1971 – and another two earlier in his career: Tram-Stop by the Nile (Heinemann, 1958) and Paved with Gold (Heinemann, 1959). This thread enquiring after his whereabouts suggests that he was possibly a schoolteacher in north London, and also mentions that there's a bit of biographical detail in others of his books (there's nothing about him in either the Blond or the Pan editions of Only Lovers Left Alive). Unfortunately, not having access to those books, I can't shed any light there. 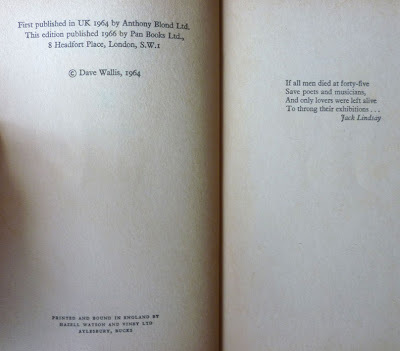 If Wallis was, as The Encyclopedia of Science Fiction maintains, born in 1917, it's doubtful he's still with us, but if anyone chances upon this post and has any further information – not a completely unknown occurrence here on Existential Ennui – please do leave a comment. UPDATE 3/6/13: Steve Holland has since put together a thorough biog of the – as it turns out – late Dave Wallis over at Bear Alley. Dave Wallis taught Englsh and French at Earls COlne Grammar School 1971 to 75 when the school was closed. I remember the Head reading out an excerpt of another of his books "Tramstop in the Desert"
Thanks for that snippet of info, Anonymous. If you turn up anything further on Dave Wallis, do please let me know.